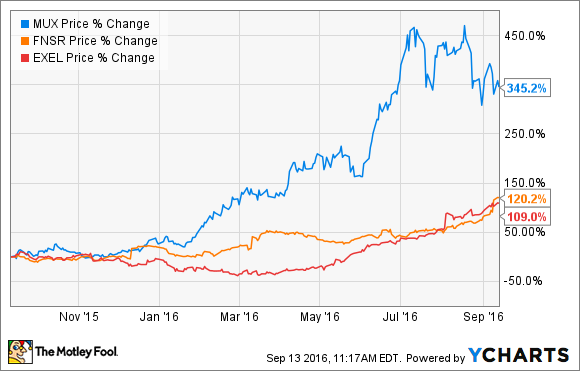 In the span of just one year, these three companies generated returns in excess of 100%. There's more than one way to skin a cat, and more than one path a company can follow to double an investor's money in the course of a year. These three companies, have managed to do just that, despite blazing different paths to the same end. Going their own way in helping shareholders enjoy returns in excess of 100%. Midcap cancer-biotech Exelixis (NASDAQ:EXEL) has more than doubled over the last 12 months -- it's up 108% -- as the handful of therapies it has on the market are catching on. Its treatment for second-line advanced renal cell carcinoma Cabometyx, which was just launched in April, is already generating more than $17 million in revenue, while Cometriq, a treatment for advanced medullary thyroid cancer, generated $14 million in the second quarter. In all, the biotech registered $36 million in revenues for the period, compared to just $8 million a year ago. There's potential for Cabometyx to get approved for additional indications, and trials it is currently enrolled in are going well. With the potential for becoming cash-flow positive next year and a growing cash balance, Exelixis could soon begin making acquisitions, or take on licensing opportunities that will further expand its portfolio. The rebound in precious metals has benefited metals miner McEwen Mining (NYSE:MUX) and silver streamer Silver Wheaton (NYSE:SLW), which have risen by 347% and 131%, respectively, over the past year. In that same time span, gold has jumped 20% in value, while silver has surged more than 30%. Certainly, the higher prices for the yellow and gray metals helped spur the companies higher, but there's also obviously more at play than just that. For McEwen, much of the gains it generated were predicated on having produced more gold earlier in the year as a result of improvements made at its San Jose site in Argentina, while also significantly reducing its all-in sustaining costs (AISC) there and at its El Gallo project in Mexico. Second-quarter results weren't quite as dramatic as they were in the first, and McEwen's stock has lost a quarter of its value since its 52-week high last month. However, with AISC continuing to fall, no debt on its balance sheet, and higher gold prices leading to an early payback on its advanced-stage Gold Bar project in Nevada, McEwen Mining may yet test new highs. Because Silver Wheaton doesn't have its own mines, instead buying streams of production from other miners, the same type of forces that pushed McEwen higher don't come into play here, at least not directly. That doesn't mean, however, that it can't also go higher still. In the second quarter, attributable production silver and gold outpaced last year's effort. Silver Wheaton reported 7.6 million ounces of silver and 70,200 ounces of gold, respectively, were produced compared with 7.2 million ounces of silver and 50,100 ounces of gold a year ago. Sales were up 28% and 16%, respectively, from last year, too. Yet the company is also investing in its future, taking on more financing of mining operations in exchange for future streams. For example, it recently negotiated an additional 25% of life-of-mine gold production from Vale's (NYSE:VALE) Salobo mine, Silver Wheaton's strongest asset. It already owns 50% of the mine's gold output, but for an upfront payment of $800 million, which Vale is using to help lower its massive debt load, the streamer is preparing for future increases in gold's price.